The great thing about writing my blog & recording my podcast monthly rather then weekly is that I have so much content - too much in fact. Here's some of the best bits... The year has started out with me firmly focused on stash busting. This year I'm going to be even better at it than usual because I have Lynne Rowe's Use it or Lose it campaign running for the whole year. I love "-alongs" that go on for the whole year. There is less pressure of a deadline. 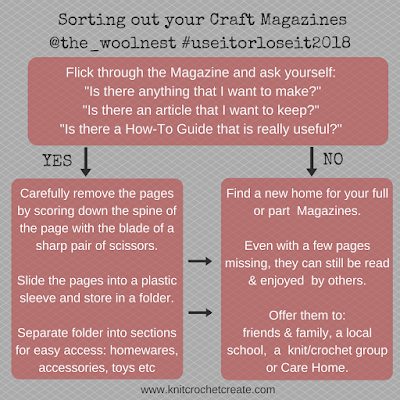 Some of the rules are a little harsh like removing a pattern from a magazine only if you have stash for it and otherwise giving the magazine away. I just can't do it so I am modifying the rules (I'm a master at modifying to suit) and Lynne says that's OK fortunately. 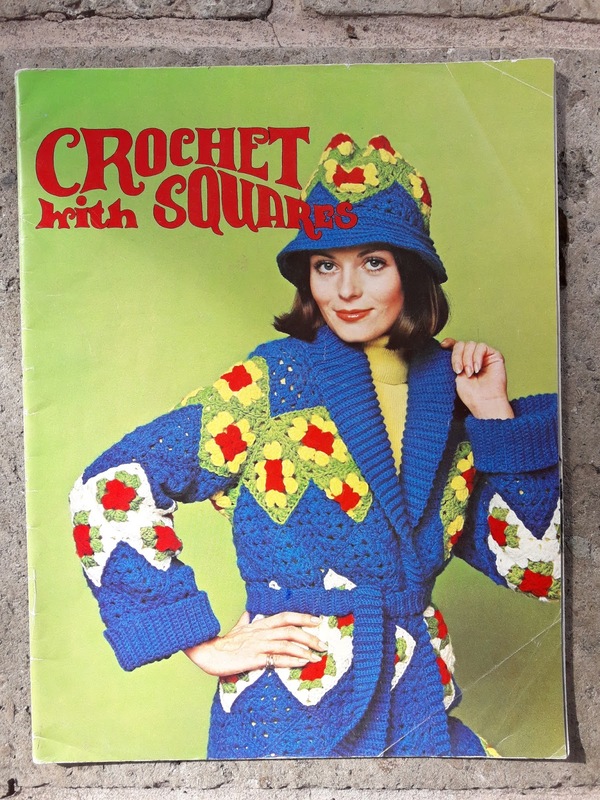 So I am keeping the entire magazine if it contains more than a single pattern and even for the single patterns I'm pulling out I'm kind of optimistically imagining that I have exactly the right stash yarn to suit. Once you get started it's almost addictive. I've got through all my magazines now and I'm putting them into categories in a folder - crochet patterns are sorted into garments/accessories/other and I also have other craft projects and techniques.There are more details on Lynne's blog here on how to take part and chatter in Lynne's Ravelry group. There's also the hashtag #UseItOrLoseIt2018 on Instagram. 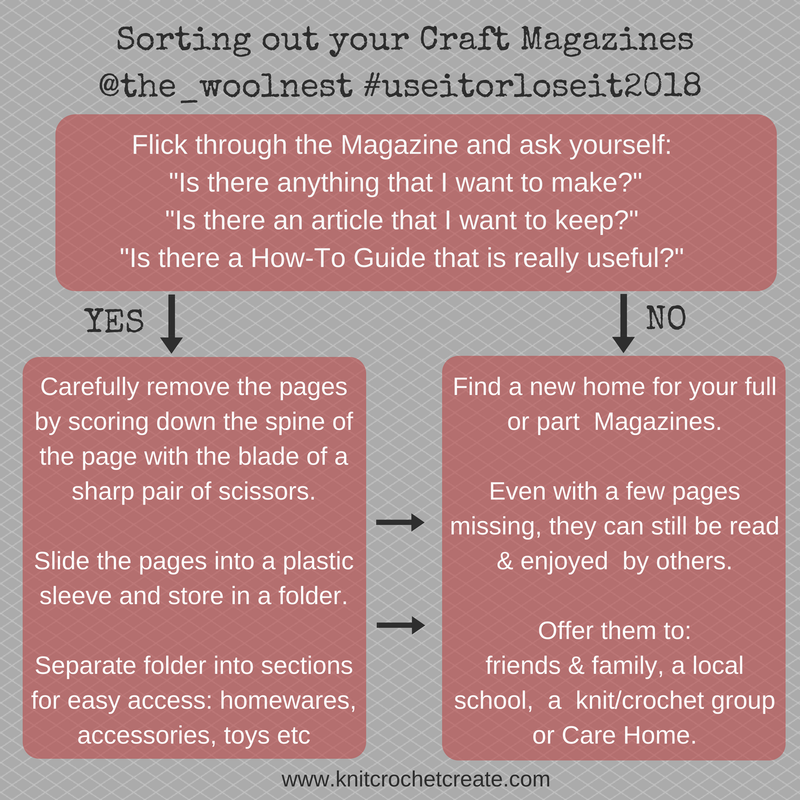 Lynne sent over a helpful image of how to handle those magazines. Give it a go. Decluttering is very liberating. Still on the theme of shifting some of my huge yarn collection, the ultimate stash busting project has to be granny squares. And rather conveniently this week the Granny square CAL or crochetalong has kicked off. Yay! It's hosted by Rosina of the Zeens and Roger podcast. I plan to make motifs for a poncho or garment of sorts and also at least one huge granny square blanket to donate. My lovely Yak and Yarn group make products to give to local charities. There are details here on Rosina's blog, chatter in her Ravelry group and a hashtag of course #GrannyCAL18 on Instagram. I found this amazing magazine dating from 1974 while I was decluttering. This one I am keeping unless Rosina really wants it! The most exciting thing that has happened this year so far ... I've started making instructional videos for YouTube. I am a teacher and I've thought for a long time that this is what I should be doing. I've only got one up there so far so don't get overexcited. My inspiration has been my 11 year old son aka SnakeBoy Dude who recently started his own channel. I'm recording short clips showing how to crochet different parts of a sock - toe, foot, heel... and so on. I'm using the pattern I wrote last year for my class that I taught at the Houston Fiber Fest: The Leftover Crochet Sock. It's a small toe up sock designed to cover some of the key techniques. I think I'm into double figure subscribers now. Go me! I hope the start of your year has been fabulous. Are you going to join me in the Use it or Lose it Campaign and/or on the Granny CAL? Do let me know what you thought of my first video too. Have a wonderful month y'all and I'll be back here on the first Friday of March. In the meantime you can find me doing my crochet thing on Instagram, Twitter, Ravelry and Facebook as Craftyescapism. Thank you so much Nicole for the feedback. So pleased you liked my video! !